Tall Fescue is a grass species that will do quite well in areas dominated by drought and heat. This is due to the plants deep root structure that allows it to withstand moisture stress, poor quality soils and water excess. 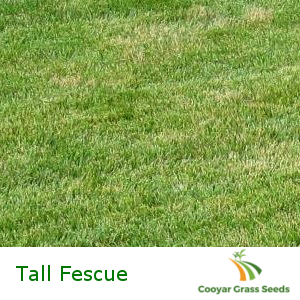 For this reason Tall Fescue will grow throughout Australia and is most commonly used for house-hold lawns, parks and ovals. Establishment: Conditions permitting, 10 to 21 days. Sowing Rate: New lawns: 4kg – 5kg per 100 sq meters.